While our schools are Catholic in name, about 50% of our students are not Catholic. We welcome students from a variety of backgrounds. Your child may not have a background in religion or even a defined understanding of who God and Jesus are; that's okay. The faith formation students receive at ICS and Monroe has proven to serve as a foundation for greater connectedness within community. It allows students to grow in understanding that God’s grace does indeed permeate all of reality, and that the world is truly a place of infinite possibility. All students take religion classes each year. Each day begins with prayer and pledge. 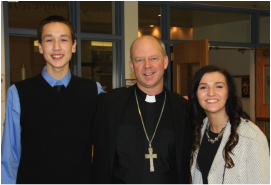 Students attend weekly mass, celebrate seasons of the Church year, including Advent and Lent, participate in community service projects and attend retreats. We teach about God and Jesus and about the men and women found in the Old and New Testaments. Students study scripture and learn about the “where” of the Old Testament writings and the historical impact of these books. Students learn about social justice, sacraments and prayer, memorizing some prayers and learning to write their own. Other topics studied include: The Ten Commandments, Jesus’ two commandments, the Beatitudes, the parts of the Catholic mass, the Rosary and the lives of Saints.